UFO SIGHTINGS DAILY: I found the lost UFO Photos On NASA Site Again (3rd time of hide and seek) UFO Sighting Daily. I found the lost UFO Photos On NASA Site Again (3rd time of hide and seek) UFO Sighting Daily. Hey guys, last week I found the photos of the UFOs that were HD quality and 100% focused. NASA has deleted their location two other times and moved them to a new unknown location. They do this to protect themselves in a court of law. "We didn't delete it, just moved it to a new location," is what they would say to the judge to get the case dismissed. Well I found it for a third time. It was a little harder this time, but got them all. 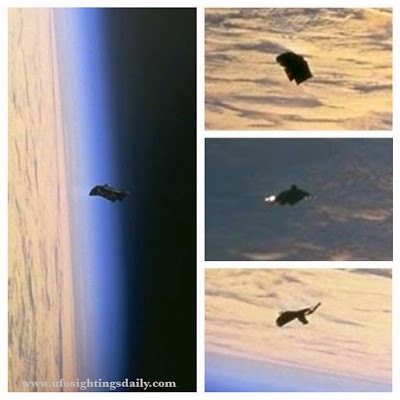 Many people call these the Dark Knight Satellites, maybe they are, but regardless...they are UFOs. They are of alien construction. I also got into the original site, but not using a hack. Originally it was open to the public, but now it either locks out all foreigners outside of USA or it locks out all non NASA people. Odd...I tried it today and it let me in normal. Either way, I got into it again. :) It has about 1.7 GB of photos on that site, and only about 20mb are visible. Sure wish I could look at them all. But below are the links to the original photos I found. Record them...they will be moved again in a 1-2 months time...just like last time I reported them.